My Granny was not a kitchen goddess. 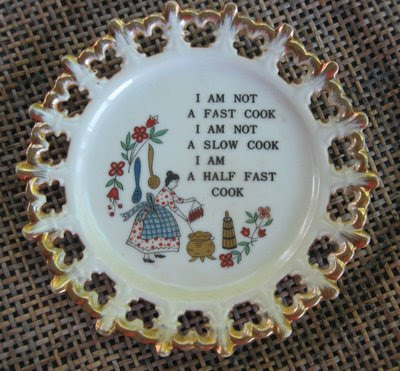 She was, as her favorite collectable plate stated, the Half Fast Cook. I am not a fast cook. I am not a slow cook. I amd a half fast cook. Kitchen plates were popular with Granny's generation, and my Grandma (Mom's side) had a plate that said, "Two things are always open. Grandma's arms and Grandma's kitchen." I ended up with that plate and love it, but Granny's plate is the one that always makes me laugh. I guess I got genes from both sides when it comes to the kitchen. I love to cook when I'm in the mood. When I'm not in the mood, I don't feel a bit bad about picking up a pizza. I would feel better about having it delivered, but since I live out in the middle of nowhere, they don't even deliver out here. That's a sorry state of affairs huh? My favorite type of cooking is outdoor cooking, and I have my own grill and barbecue site called Yes You Can Grill and also a new cooking space with old family favorites called Yes You Can Cook. What you'll get with both of those sites are common sense ideas, tips, recipes, and product reviews. Well, this is where I play with my food and put my elbows on the table. You'll find all kinds of random fun stuff about cooking and food and maybe a half fast recipe from time to time.